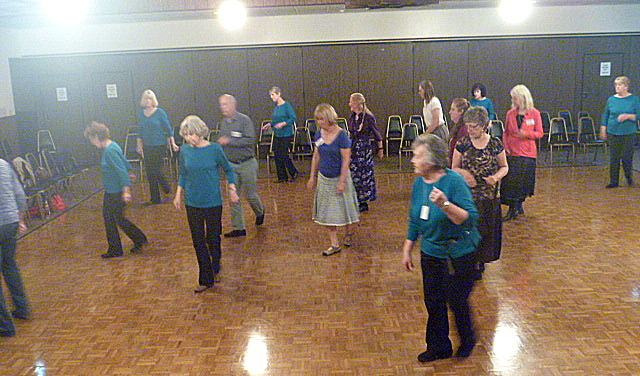 This weekend, our friends in Coos Bay hold their monthly International Dance session. Sponsored by the South Coast Folk Society and taught by Stacy Rose, this fun evening will inspire you even if you just watch. Stacy teaches beginning dances from 7:00 pm to 8:00 pm with request dancing from 8:00 pm to 10:00 pm. This is an activity for all ages (see our family dance in the 5th photo below). No partner is needed. Dress comfortably. Come dance with Stacy and the Coos Bay, Oregon folk dancers at: 93393 Greenacres Lane, Coos Bay, Oregon 97430, on Friday, May 26th, 2017. Admission is $4.00. Call Stacy for more information or directions to Greenacres Grange @ 541-808-1002 And enjoy our previous post below which includes our Coos Bay dance friends in the second photo. Social dancing has existed since Homo sapiens could wiggle and possibly before as critters also do various kinds of what could be termed dancing. Every country of the world has celebrated harvests, weddings, feasts and gatherings of all kinds with dances specific to their country, region or village. Today those dances, some of them very ancient, are being preserved through active folk dance groups across the planet. Most countries have folk dance groups specific to their country with original music and costuming. Some groups are professional and some are recreational but often with a performance aspect. Many folk dance groups are eclectic in their repertoire and do dances from many different countries. These groups are categorized as “International Dance” to distinguish them from any specific area. They learn, dance and often perform in costume dances such as Tzadik Katamar from Israel, Hora Mare Bucovineana from Romania, Hoy Memo from Turkey, Tai Tai from Greece and 12th Street Rag from the USA. Here in Oregon, there are hot spots of International Dancing from Portland along the I-5 Corridor to Eugene, Creswell and Ashland. On the coast, we have some of the best International Dance going starting in Florence with the Oregon Coast International Dancers. Here they are dressed in village style Balkan colors of black, white and red in authentic, imitation costuming. They occasionally “dance out” with other folk dance groups traveling to their location. 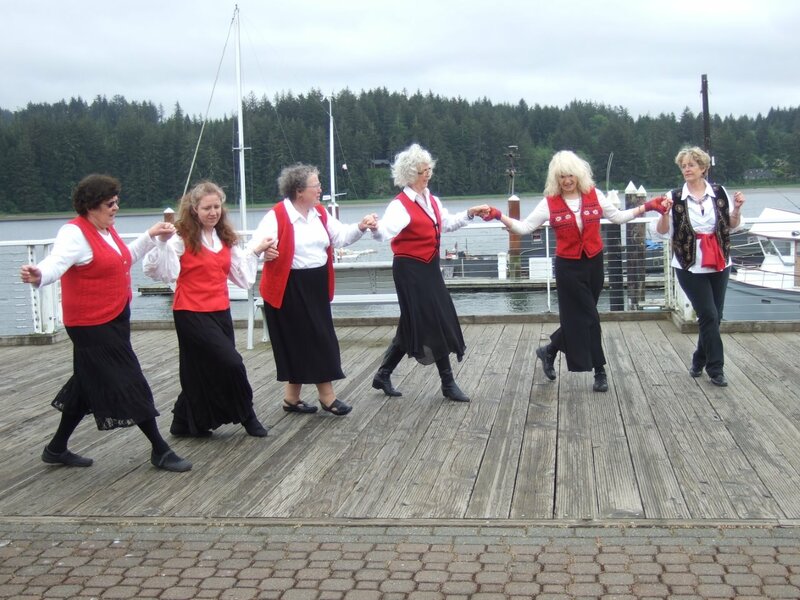 One of the places they visit is Greenacres Grange a bit south and east of Coos Bay where they dance with the Coos Bay Folk Dancers under the direction of Stacy Rose. 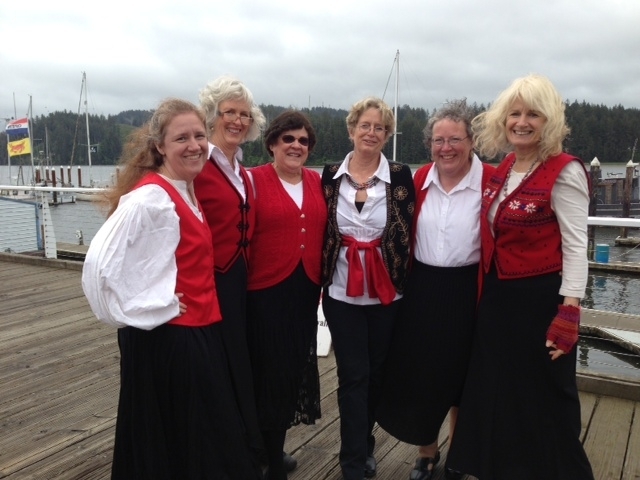 In this photo, the Port Orford Folk Dancers lead by Vickie Isaeff came for this dance evening also. 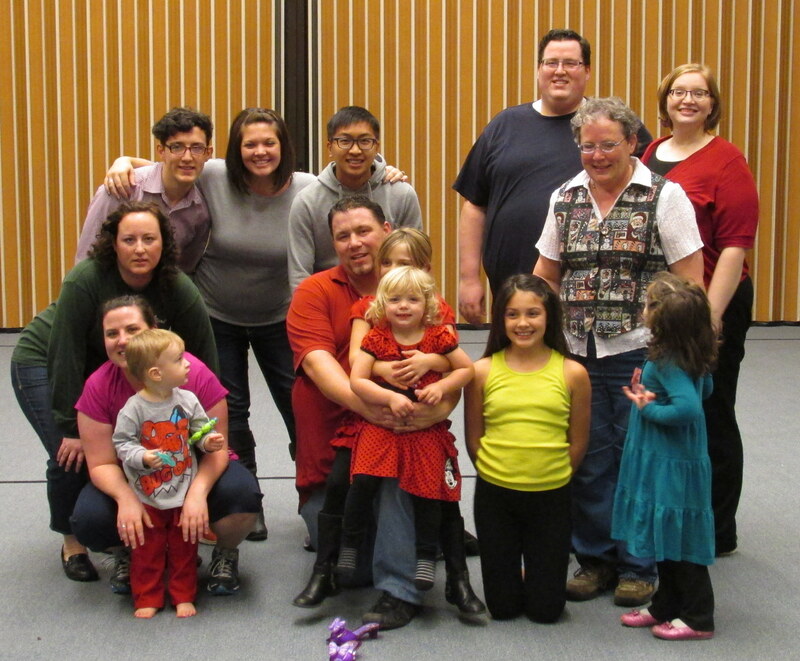 Late December 2015, we had a New Year’s dance with dancers from Coos Bay, Eugene, Florence and Creswell. 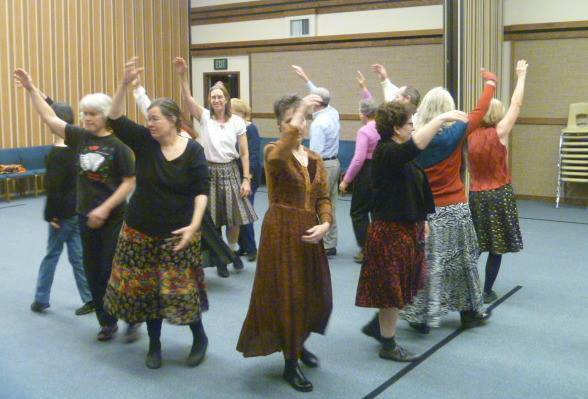 Our dance friend, Sally Jenkins, can be seen in the center in white blouse leading a dance. Sally is from Creswell’s Movable Feet dance group. 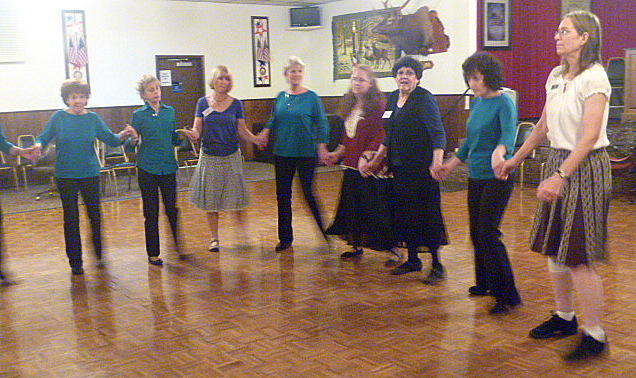 Instructors from 3 different dance groups took turns leading and teaching dances. We tend to stay home on NYs Eve but this is a fun way to celebrate the coming New Year a bit early as you dance the night away. 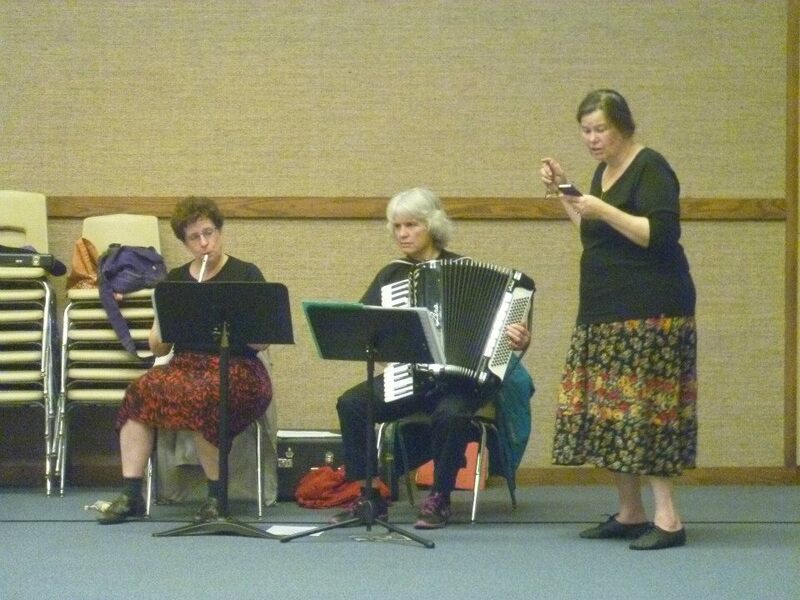 The very talented Stacy Rose also plays flute and penny whistle and joins with various other musicians to accompany folk and contra dances. Here she is lending her talents to those of Sharon Rogers on accordion with Eva Moravcik’s very lovely voice singing in various languages during our NYs dance night. During the 2014 holiday season, we were asked to provide a participation folk dance program for the family of one of our dancers. It was a big success for the family and fun for OCID to join them. Folk dancing at celebrations in the villages is traditionally a family affair. Young ones learn from a very early age how to do the steps and dances as they follow their family adult dancers from behind the line. By the time they are teenagers they have become expert at the dancing. In March of 2015, we held another dance event in Florence with OCID and the Country Western Line Dancers under the direction of Pat Wheeler. They are the ones in the pretty blue/green tops. 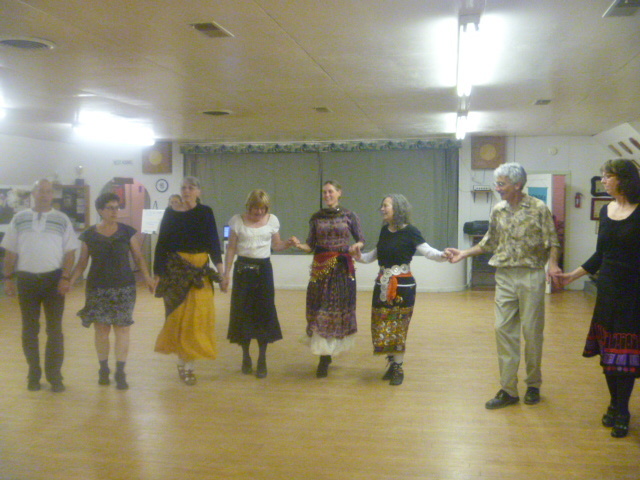 They learned many folk dances and OCID learned several CW line dances. The teaching was shared by instructors from 3 different dance groups. A good time was had by all. Occasionally OCID will dance on the boardwalk in Old Town Florence. The music and dancing always bring residents and visitors to watch, ask questions and often they will join in the dancing and this fella did. Look at everyone smiling! It’s always a happy, fun time dancing with OCID! Many other styles of dance live here on the Oregon Coast including Middle Eastern, Big Band, ballroom, Flamenco, ballet, jazz, tap and more. However, International Dance is easy, fun, great exercise and doesn’t require a partner. 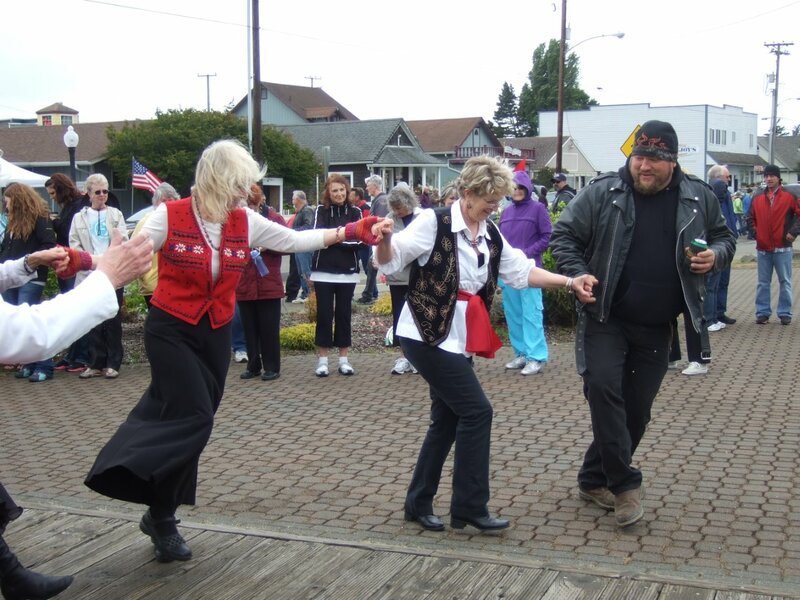 Come stay with us at Umpqua River Haven (www.umpquahaven.com) and take part in this multi-flavored dancing. Dance opportunity is just an hour away. Any of the groups would love to have you join them in the dance! Really great to see all those dancers – Fun, fun, fun! Enjoy reading about the dancing!